We are excited to be part of a two year project called The Primary Writing Project. We work with other schools and have high quality training for all staff to implement the project into our school to ensure better outcomes for all children in Reading and Writing. Talk for Writing is a project that is developed by Pie Corbett, it is powerful because it is based on the principles of how children learn. The project enables children to say and learn the language for writing aloud before they write giving them life long reading and writing skills. The teachers plan an engaging WOW moment to 'hook ' the children's excitement. A Talk-for-Writing unit would begin with some engaging activities to help children internalise the pattern of the language. 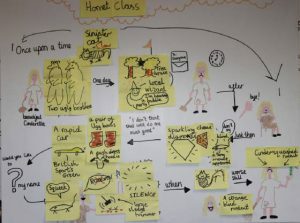 This is often followed by the children talking a text that is learnt by the class, this is supported visually by a text map and actions to help the children recall the story or non-fiction piece. In this way the children hear the text, say it for themselves and enjoy it before seeing it written down. Once they have learnt the language of the text, they are in a position to read the text and start to think about the key ingredients that help to make it work. This stage includes a range of reading as-a-reader and as-a-writer activities. The class create a toolkit for the type of text they are reading so that they can talk about the ingredients themselves – a key stage in learning what they need to use as writers. Once the children have learnt the text, they are then ready to start innovating (changing) parts of the text. The children orally rehearse what they want to say, creating their own version. The key activity in this stage is shared writing planned by the teachers, helping the children to write their own by “doing one together” first. Children will be supported when writing their 'innovated' text. They will learn about the writing process, where to use punctuation, spelling and grammar through guided writing. The children then will 'show what they know' by writing the text independently with no support. In Nursery the children follow this process but just orally. The teacher plans in different opportunities for the children to write in short burst writing activities. There are opportunities in the curriculum for the children to independently apply all the skills that they have learnt without the scaffolded support. We love to celebrate this writing by publishing stories for the library and sharing with our parents. Look who the staff were lucky enough to meet and have some training with... The King of Talk for Writing himself... Pie Corbett!!! He has inspirational to the school team and his 'Primary Writing Project' has had a huge impact on the teaching and learning on Literacy across the school.